Reading this Chron story about the problem of voter registrations done via the Department of Public Safety, it’s clear why this is an ongoing issue. Neither the DPS nor the secretary of state tracks motor voter complaints. Nor can state officials say whether any individual offices or workers process abnormally low numbers of new drivers’ voter applications, DPS officials said. Unexplained dips sometimes show up in monthly motor voter registration statistics, the Chronicle found in its analysis of registration data from the secretary of state. 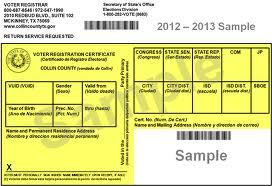 For example, only 41 Fort Bend voters registered or updated registrations via the DPS in May 2012 – compared with 913 in April and 1,402 in June, according to data gathered by the secretary of state. Spokesmen for DPS and the secretary of state recommended that anyone who fails to get their voting cards within 30 days after attempting to register call state or local election officials. [Fort Bend County Voter Registrar John] Oldham said he’s long been concerned about voter confusion over a two-step process that voters use when they renew their drivers’ license via a DPS website, which then links them separately to the secretary of state site to update their voter registration. He said he hasn’t heard as many complaints from voters who attempted to register in person at a DPS office, though he dealt with similar issues back when he worked on elections in Illinois. Very simply, nobody owns this. The DPS and the Secretary of State don’t see it as a priority, or they’d at least be able to comment on why the number of registrations processed can vary so wildly from month to month. Rick Perry has no reason to care about this, so he’s sure not going to make them make it a priority. The best that could happen at this time would be for a legislator who has the ability to stick it to DPS or the SOS in the budget to take this up as a cause and bludgeon these two agencies into doing an audit or something. But until a Secretary of State is appointed who wants to fix this and implement a better process with better technology – and fight for the budgetary means to do it – we’ll hear the same stories in 2014 and 2016. So the fish rots from the head first…remind me again who is our governor and secretary of state?